Patrick Hoban celebrates after the game. 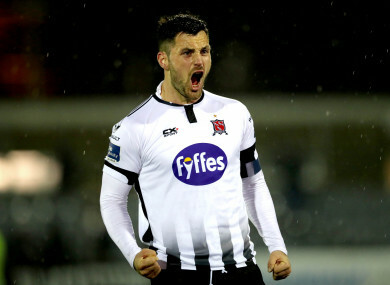 PATRICK HOBAN’S 95TH-MINUTE penalty stunned Bohemians as Dundalk stole all three points at the death at Oriel Park, in a result that could ignite the defending champions’ title challenge having been outplayed and out-thought for much of this frantic encounter. Danny Mandroiu and Kevin Devaney should have done better with their first-half opportunities, but the Bohs pair miscued. The out-of-form hosts remained blunt in attack throughout. Key players Chris Shields and Patrick McEleney came off the bench in the second half having overcome long-term injuries, but even they could not lift the Lilywhites. Bohs, meanwhile, were a constant threat. Ryan Swan tested Gary Rogers before Rob Cornwall headed just wide, while Mandroiu also brought a save out of the experienced ‘keeper. At the other end, James Talbot had no such worries as the Gypsies looked set to claim an eighth clean-sheet of the season. That was until four minutes into injury-time when substitute Daniel Kelly was taken down in the box by Paddy Kirk, and up stepped Hoban to bury the spot-kick in the bottom corner. Not since a long streak at the end of the 2012 season – which saw the club avoid relegation through the playoff – had Dundalk lost three league games in-a-row. In a bid to avoid that happening here, head coach Vinny Perth shuffled his pack with four changes from Friday’s defeat in Sligo. Dane Massey, Seán Murray and Daniel Kelly along with captain Brian Gartland – who was not in the matchday 18 – were replaced by Dean Jarvis, Joe McKee, Jordan Flores and John Mountney, as Perth switched to a back three. Bohs boss Keith Long surprised the hosts by selecting just four of the starting XI that won at Finn Park 72 hours earlier. Rob Cornwall returned from suspension, but there was no place in the squad for the likes of Derek Pender, Darragh Leahy, Keith Ward or top scorer Dinny Corcoran. Still, it was the Gypsies that could have been ahead inside four minutes when Keith Buckley’s cross from the right found Mandroiu, who had peeled away to the back post. However, the Republic of Ireland Under-21 international got under the ball and could only direct it over from six-yards. As Bohs did well in possession, Dundalk’s frontline was feeding off scraps. Patrick Hoban’s off-target header, from a well-delivered Flores set-piece, was all they had to show for their efforts in the opening quarter. Bohs should have been ahead on 35 minutes when Dundalk were almost masters of their own downfall, as Swan robbed Seán Hoare deep in opposition territory. Ali Reghba delivered dangerously from the right, but the in-rushing Devaney could only strike the side-netting from close range. Midfield stalwart Shields returned from a six-week injury layoff 11 minutes into the second half; the substitution was met with loud cheers from the Oriel Park faithful. They were almost silenced moments later when Mandroiu broke through the middle and laid a pass into the path of Swan who raced into the box and forced a fine save from Rogers. The ‘keeper was then relieved to see a Cornwall header flash wide. McEleney was thrown in by Dundalk, after recovering from a foot injury which had kept him out since the opening day of the season two months ago. On 67 minutes, the visiting supporters were given further encouragement when a fierce Mandroiu free-kick from distance tested Rogers, who needed two takes to gather. If anyone was to win the game, it looked like it would be Bohs. But Long and his players were left in shock on 94 minutes when referee Tomás Connolly pointed to the spot after Kelly went down under Kirk’s tackle. After a brief delay, Hoban kept his cool to shoot Dundalk to a huge three points. Dundalk FC: Gary Rogers, Seán Gannon, Daniel Cleary, Seán Hoare, John Mountney (Daniel Kelly 73), Joe McKee (Chris Shields 56), Jordan Flores (Patrick McEleney 61), Dean Jarvis, Jamie McGrath, Michael Duffy, Patrick Hoban (c). Bohemian FC: James Talbot, Andy Lyons, Rob Cornwall, Aaron Barry, Paddy Kirk, Keith Buckley (c), Robbie McCourt, Ali Reghba (Danny Grant 74), Danny Mandroiu (Scott Allardice 90), Kevin Devaney, Ryan Swan (Sam Byrne 88). - Updated 0.08am to correct the Dundalk player who was awarded the late penalty. Email “Hoban the hero as his 95th-minute penalty gives Dundalk the edge against Bohs”. Feedback on “Hoban the hero as his 95th-minute penalty gives Dundalk the edge against Bohs”.